Heidi Duckler Dance Theatre (HDDT) recently extended a special invite to cover the creation process for Once in A Whale with their dancers, choreographers, visual artists and composers. The company will perform the world premiere, Once in a Whale, as a pop-up presentation on Friday, March 23 at 8:30 pm at the Pacific Design Center (PDC), 8687 Melrose Avenue, West Hollywood, CA 90069, incorporating the Design Is Global theme of PDC’s annual WESTWEEK with choreography focused around the center’s architectural qualities. Tickets are currently on sale with discounts for WEHO residents and students. There will also be a post performance reception. HDDT’s Once in A Whale is divided into four sections – Fall, Summer, Winter, and Spring – allowing guests to enjoy the performance while traveling through the elaborate lobby of Center Blue, designed by Cesar Pelli in 1975. Once in A Whale will express and focus on global climate concerns and the importance of human bonds, aligning with HDDT’s 2018 commitment to the environment. Last month HDDT premiered Ebb & Flow: Culver City Festival which was a site-specific community festival of local artists at the Baldwin Hills Scenic Overlook that integrated dance, visual arts, and technology to explore our relationship with and impact on the environment. We are animating the entire lobby with the audience traveling throughout. We are doing a piece about climate change, and the dancers represent the different seasons. Each season has its personality with Fall being very feminine, a little bit like sleeping through her alarm clock. And then you see Summer, very impetuous, kind of a bully, very smothering and overbearing. Spring is very resilient. She’s a fighter even though she’s a small girl, and she keeps popping up. And then Winter is sort of a duel personality, kind of neglectful but then overbearing at the same time. For today we are creating the choreography, creating the music. It’s a rehearsal, an attack and an address…all those things rolled into one because we only create on site. We don’t create behind closed doors, in a studio. So it’s going to morph? Exactly it’s designed for the space. Typically, when you mold your choreography into an environment how do you like to shape it? How intuitive is it or do you look at structure? I’ve been visiting the site for many days and in the last few months, so it’s all planned out spatially, in what I call ‘spatial math’. That part is all kind of set. But the movement design – that is left to the talents of the dancers who are incredible artists in their own right. We do it together. And that part is sort of the last part created. It really is in them. Heidi Duckler Dance Theatre was founded in 1985 by choreographer Heidi Duckler, Heidi Duckler Dance Theatre has created thought-provoking and constantly evolving dance experiences for more than 30 years, engaging audiences through artistry in non-traditional locations. 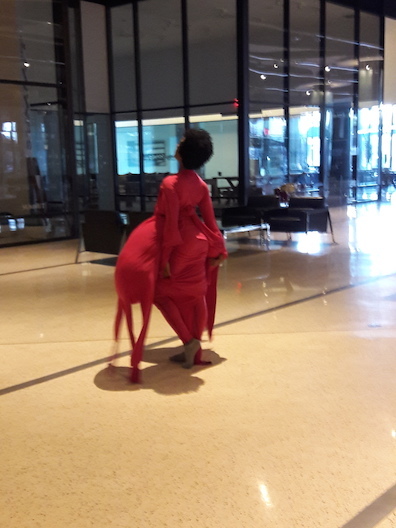 HDDT reaches out to underserved audiences with location-based performances, offers educational programs that introduce movement to young audiences, encourages arts audiences to discover new places and uses dance to communicate issues like climate change, water shortage and gender equality. By encouraging movement, HDDT brings everyone together. ** This performance is made possible with funding from the City of West Hollywood’s WeHo Arts Program.